Happy Wednesday!! Today I thought I’d share a few pieces that are perfect for transitioning from winter to spring. Which is your favorite?! I’m glad you found a pick you like! These are gorgeous pieces! I really love those pink loafers! Love these pieces. And what’s crazy is that they can all be mixed and matched together. I especially love the scarf and the blouse in the center! Cute! This has me looking forward to Spring! That’s so true! I didn’t even thinking about mixing and matching them! I’m so looking forward to spring! Love these pieces! The colors make me think of Pantone’s serenity blue and rose quartz pink! I love those Pantone colors! Thanks! Was that Club Monaco sweater restocked in ivory? If so, the only size left on the website now is a Large. I would need it in an XS, so I’m very bummed out. I keep missing out on it. I’m trying to like it in black, but it doesn’t quite float my boat. Those Nicholas Kirkwood loafers are great. I love them in the light grey and the blue suede. I think it was, but sold out so quickly! I know Neiman Marcus had a similar one that I also love! I’m obsessed with the loafers, I’m glad I’m not the only one! Thanks Mollie! Couldn’t agree more!! I love that blush wallet, so cute!! I’ve been trying to figure out good transition pieces… it feels like that time of year where I’m sick of everything I own and need a change in weather. But I love these. Especially the blue sweater with the bows on the sides. I’m so glad you love these! Yes, I agree, such an awkward time of year! I love the pieces you’ve shared here, Rach, especially the sweaters, the TB bag and those gorgeous flats! Thanks for sharing and I hope you’re having a great week so far! I’m so glad you liked my picks! Thank you! Love the pastels! 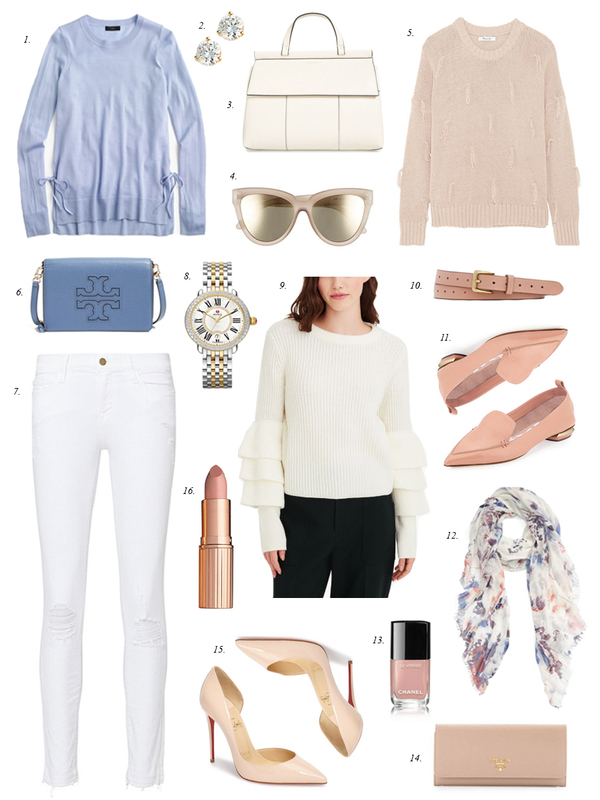 I’m always drawn to neutrals and light colors this time of year, especially since it’s so gray and ugly out! Love these pieces; definitely going to snag quite a few of them!